The First Holy Communion Dress and Headpiece for the popular American Girl Doll. 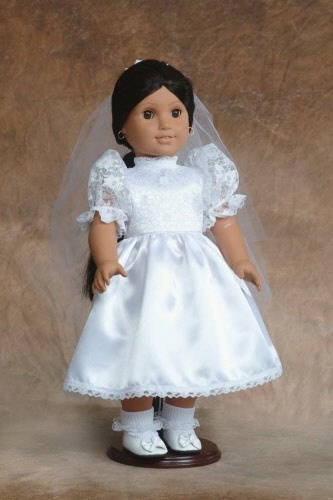 The first Holy Communion Dress for the popular American Girl Doll is constructed of high quality white satin. The bodice has a lace overlay and gathered sheer lace sleeves. The dress comes with a headpiece trimmed with silk flower and bridal illusion. The headpiece is attached to a barrette which easily clips to the doll's hair. This outfit is designed by Debby to be flattering in the doll and yet similar to the girl's dresses. The quality fabrics and construction allow the outfit to be a keepsake, yet the pricing let the girls have lots of fun dressing their dolls for their big day. Communion outfits are shipped in a box to prevent wrinkling. Shipping Charges for USPS First Class Mail $1 - $49.99 is $3.50, $50 - 99.99 is $6.00 and over $100 Free Shipping.